Our Chocolates Will melt your heart... and make you smart. Because we make them the natural way chocolate used to be made, before the age of super-refined and powdered sugars and mass production. The Aztec way, rich and smooth. With natural sweeteners, so they are super healthy. But that's just the start. We craft our chocolates with pure cocoa liqueur and cocoa butter. They constitute 74% of our recipes, the rest being Sugarlesse™, our natural sweetener and other natural ingredients. Add to that the effect of flavonoids, prevalent mostly in dark, rich chocolates. They are well known to boost your brain power. A study published in the Journal of Nutrition reported that, out of 2031 participants, those who regularly consumed dark chocolate, wine, or tea, had significantly better mean cognitive performance test scores than those who did not. ​Can you imagine a sweet indulgence with only 50 calories and a totally negligible Glycemic Index of 11? Both due to Sugarlesse™, our natural sweetener. Diabetics rejoice — this is your chocolate too! We know these terms are bandied around a lot these days. They are even associated with "marketing speak" sometimes, unfortunately with some justification. This is what they mean to us and to you: Minimally processed chocolate in environmentally friendly packaging. 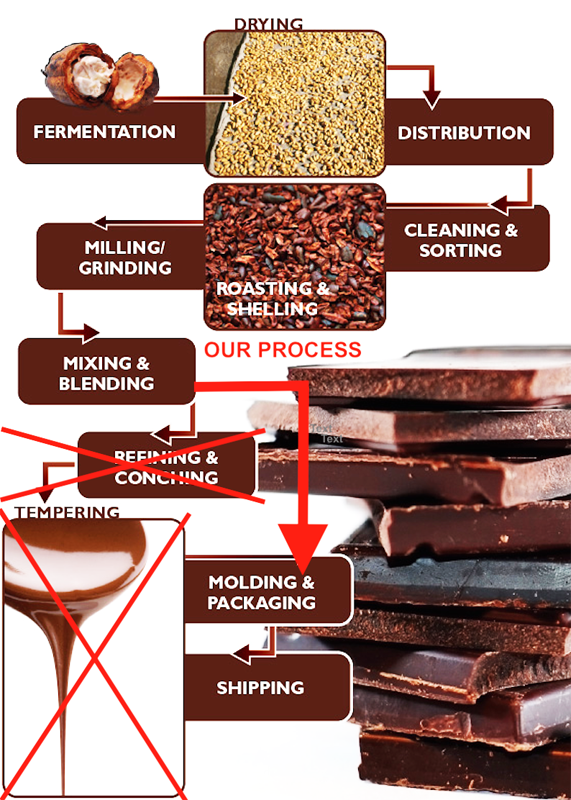 We spent three years to develop our ChocoSustain™ process and finesse our recipes. Our method is the very first one capable of producing the highest quality, rich, and smooth chocolates without the two most energy intensive steps: conching and tempering. This is what it looks like in a "cocoa nut shell:"
how ABOUT a bit of trivia: Can you guess how much chocolate we consume? ​How about 9.5 lbs a year for each American? Since most chocolates here contain only 20-40% cocoa and a LOT of sugar, the latter more than counterbalances their health effects. Even worse, they can contribute to obesity and diabetes. Did you know that the Swiss, Germans, and Austrians are the biggest chocolate gluttons globally? The top title, of course, goes to Switzerland — they binge on more than 20 pounds a year. However, unlike Americans, they prefer dark chocolate with over 70% cocoa, which is the healthy kind, like our Einsteins.